Written for designers, specifiers, builders, regulatory and certifying authorities, WoodSolutions Guides provide comprehensive, easy to use advice on meeting the requirements of the NCC. 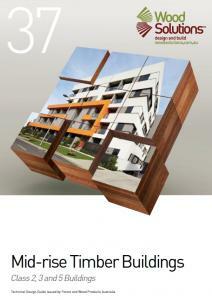 The National Construction Code1 2016 Volume One (NCC), Building Code of Australia, Class 2 to Class 9 Buildings, allows the use of timber construction systems under the Deemed-to-Satisfy (DTS) Provisions for Class 2 (a building containing two or more sole-occupancy units (SOUs) each being a separate dwelling), Class 3 (residential buildings, other than buildings of Class 1 or 2, which are a common place of long-term or transient living for a number of unrelated persons, including hotels) and Class 5 (offices) buildings up to 25 metres in effective height, known as mid-rise construction - see figure below. 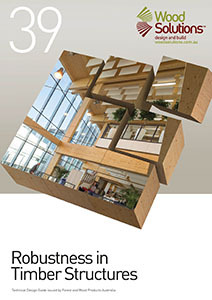 The new provisions cover both traditional ‘lightweight timber framing’ and new ‘massive timber’ systems such as Cross-laminated Timber (CLT) and consist of the use of appropriate layers of fire-protective grade plasterboard – termed ‘fire-protected timber’ in the NCC – and the use of compliant automatic sprinkler systems. Hard copies of most WoodSolutions' Guides are available for purchase from SAI Global. 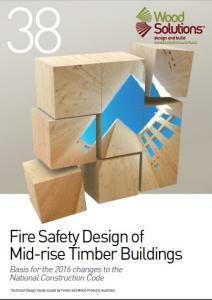 This Guide explains how to achieve the targeted fire and sound Performance Requirements in the National Construction Code (NCC) for Class 2 (sole occupancy), 3 (multi-residential) and Class 5 (office) mid-rise timber buildings using the Deemed-to-Satisfy pathway for fire-protected timber introduced in the 2016 edition of the NCC. Details of figures in this Guide in Revit, CAD, Archicad, pdf and jpg formats are available for download as zipped archives at base of this page. A best practice guide for Australian buildings offering advice, design methodologies and details for typical building types. This Guide has been written by specialists to give background on the subject of structural robustness and provides practical advice to building designers on how this new requirement can be met. The Guide covers all structural materials, with a particular focus on timber. Details of figures in this Guide in Revit, CAD and Archicad formats are available for download as zipped archives.